A massive alligator has some wondering if it's the biggest ever in Florida while others wonder if it's fake. What do you think? A video of an alligator walking around Buffalo Creek Golf Course in Palmetto, Florida, has gone viral, with some saying it's the biggest gator they've ever seen. Charles Helms posted the original video, News 3 reported. The video shows the gator's size in relation to a gentlemen who moved closer than Helms to record a video of his own. 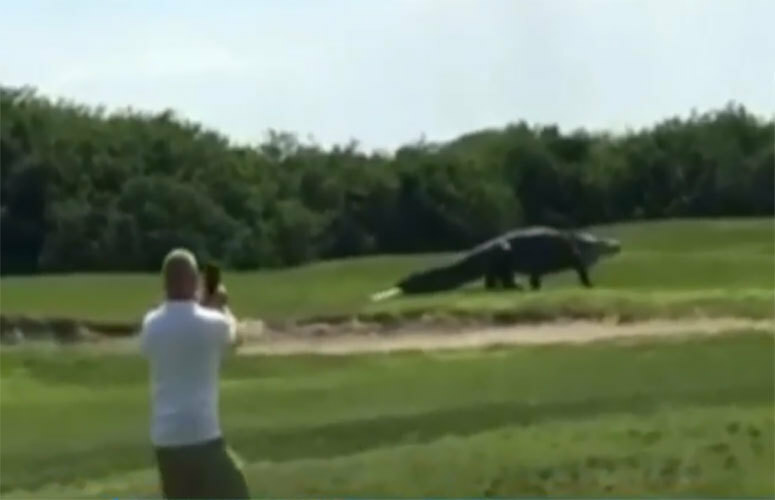 Though the video was recently posted, Buffalo Creek Golf Course said the alligator has roamed the course for years. "People have heard that he is out here and that is all they want to see so they will bring spectators to ride so somebody can get a picture," pro shop clerk Wendy Schofield told News 3. "He doesn't bother anybody and they don't bother him, he's like a mascot for the course, which is owned by Manatee County." "He has been here for a very, very long time, he's not new at all. There have been guesses that he's 15 to 16 feet long," the five-year employee said. "The word has spread that this is a great place to come and play. He is the highlight, but we are worth the price too." Judge for yourself below how big the gator is, but keep in mind the biggest alligator ever recorded in Florida was 14 feet long, weighing 780 pounds.